The hotel Villa Paola is located just 3 km from Rimini’s modern exhibition centre and offers numerous services and special care to its business guests. 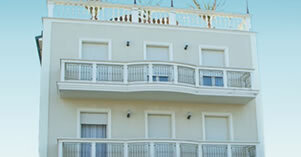 Here are our accommodation options for those looking for a 3-star hotel close to the Rimini Trade Fair. For the most important trade fairs, the Villa Paola restaurant is open and is prepared to organize corporate dinners and events upon request. During their stay, our business guests can enjoy an evening with cocktails and appetizers in the hotel. The aperitif is based on Prosecco and is accompanied by a series of characteristic appetizers: Piadina Romagnola [Romagna flatbread], Fried Gnocchi, small pizzas, focaccia [a type of rustic pizza], cocktail snacks, etc. 100 meters from the hotel, there is a shuttle service to and from the trade-fair area of the Rimini Fiera, which can be reached within a few minutes. The area has really good public transportation service connecting to the historical center of Rimini. In addition, it is possible to lease private vehicles or request a convenient taxi service. Villa Paola is a new, well kept facility a few steps away from the sea to offer, even in Winter, a striking panorama of lights, colors and atmosphere to enjoy with walks and sports activities at the beach and on the waterfront.